Mostly cloudy skies early will become partly cloudy later in the day. High around 65F. Winds WNW at 10 to 20 mph. Winds could occasionally gust over 40 mph..
Clear to partly cloudy. Low 44F. Winds NW at 10 to 20 mph. The Santa Maria City Council listens to public comments during a public hearing on rules on H-2A housing in the city, on Tuesday night. Santa Maria Valley Wine Trolley's third season begins May 11. Mark Richardson, superintendent for the Santa Maria Joint Union High School District, speaks during the launch of Arts Now Community in Santa Maria on Thursday morning. The Santa Maria City Council voted Tuesday in favor of the creation of an ordinance that would require discretionary permits for housing more than six H-2A workers in a single-family home but leave medium- and high-density housing zones with no local restrictions. The decision, which came after more than two hours of public comment and discussion, was the culmination of more than a year of debate on how the city should govern the housing of H-2A workers. The Abel Maldonado Community Youth Center at 600 S. McClelland St. in Santa Maria will extend its hours temporarily during spring break beginning Friday. The center will be open from noon to 8:30 p.m. Monday through Thursday and noon to 10 p.m. Friday and Saturday through April 27. There will be games and activities, such as Nerf Wars, access to the fitness room, pool tournaments, drones, connect four tournaments and movie nights on Fridays. Four-time Grammy Award winners TLC will take the KCOY Main Stage on July 12 at the Santa Barbara County Fair. The concert at the Santa Maria Fairpark is free with paid admission to the fair as part of the Bud Light Concert Series. TLC is considered by many as the “best-selling American girl-group of all-time,” with Tionne "T-Boz" Watkins, Rozonda "Chilli" Thomas and the late Lisa "Left Eye" Lopes performing smash hits like “Waterfalls,” “Creep” and “No Scrubs.” They earned four multiplatinum albums, four No. 1 singles and 10 Top 10 singles. Lompoc’s annual SpringFest celebration is set to once again take over Ryon Park this weekend, as organizers hope to provide a fun respite for what could be a busy week for many local families. The event, now in its 33rd year, will kick off at 11 a.m. Friday, April 19, and continue through Sunday, April 21. It is always held on the third weekend in April, but this year that timeline happened to coincide with Lompoc Unified School District’s spring break, as well as Easter Sunday. The Santa Maria Joint Union High School District's board of trustees on Tuesday took the first of several steps to replace Superintendent Mark Richardson, who will retire at the end of the school year in June. At a special 9 a.m. meeting, trustees voted to appoint John Davis, the district's assistant superintendent for curriculum and instruction, as acting superintendent beginning June 10. Richardson, who announced his retirement Friday, spent the last seven years of his 31-year career in education as head of Santa Maria Joint Union. Trustees also approved a $23,500 contract with executive search firm Leadership Associates to conduct the search for a permanent replacement. As the search progresses, the firm will work with the board, community and staff to solicit input on the new superintendent. In 2018, the firm successfully conducted a search for the Guadalupe Union School District, hiring Emilio Handall to replace former Superintendent Ed Cora. Davis will serve as the acting superintendent until a permanent replacement is chosen. The three men charged in connection to the September 2017 shooting of Edward Ramirez will stand trial for criminal street gang conspiracy and a slew of related charges after a Santa Maria Superior Court judge ruled Tuesday that enough evidence exists to hold the men to answer. Despite insistence from their attorneys that evidence presented by Santa Maria Police detectives and gang experts was insufficient to prove a criminal conspiracy, Judge John McGregor held Thomas Castillo, Nicholas Guzman and Juan Contraras to answer all charges filed against them. The trio will reappear May 2 for their arraignment. The third season of the Santa Maria Valley Wine Trolley kicks off May 11 during Mother’s Day weekend. 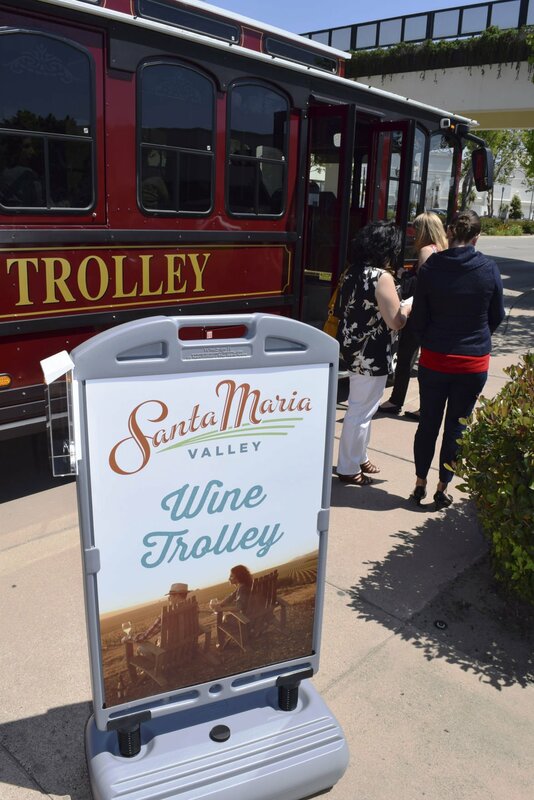 Coordinated by the Santa Maria Valley Visitors Bureau and the city of Santa Maria, the trolley takes riders to a variety of stops to experience local wineries. The trolley is scheduled to run every weekend from May 11 to Oct. 13. The route begins at Costa de Oro Wine Tasting Room, 1331 S. Nicholson Ave., in Santa Maria. Along the way, it will make stops at Presqu'ile Winery, Cottonwood Canyon Winery and continue with a stop in Old Town Orcutt, at the corner of West Clark Avenue and South Broadway Street, before returning to Costa de Oro. The trolley will run every 60 minutes from 10:30 a.m. to 5 p.m. starting at Costa de Oro. It will also run additional routes from 5 to 6:30 p.m. but will exclude Cottonwood Canyon and Presqu’ile wineries. The trolley is designed to allow guests to stop at the wineries and locations of their choosing and then catch up with it as it completes the loop. The cost per person — which does not include wine tastings — is $10 in advance, or $18 when purchasing tickets at the trolley. Woody’s Butcher Block, 700 E. Main St., Santa Maria. The trolley in an affordable way to explore the regional wine country, said Jennifer Harrison, director of the Visitors Bureau. “You get to head into the vineyards to taste local wines, and on your way back you can also stop in Old Town Orcutt to enjoy fine dining, local craft beer, shopping and more — all while experiencing the charm of riding a trolley,” she said. The Dos Pueblos Chargers (9-0 Channel League) softball team broke a tie for first place in the Channel League with a 3-2 victory in eight innings over the Santa Ynez Pirates (8-1) at Dos Pueblos. Sana Ynez’s Armani Garcia went the distance, pitching 7 2/3 innings while giving up just three hits. I’m using this column to assist college coaches and area high school programs with an important April event going on across America. That event is the NCAA Spring Evaluation Period from April 15 to May 31 – when college football coaches come to the area high schools and check in on the talent coming back. The talent level for the 2020 class is unlike anything I’ve seen in years. In all three counties of the 805, there are either going to be sleepers or cornerstones. St. Joseph clinched the Ocean League boys volleyball championship Tuesday night with a 3-1 win over Pioneer Valley. The Knights capped off the win with a 25-17 victory over the Panthers in the final set. St. Joseph improved to 11-1 in league matches. The Knights are 13-9 overall. Nipomo moved to 9-2 in league matches with a 3-0 win over Nipomo. The Titans can earn a share of the league title if they win their season finale Thursday and the Knights lose theirs. His team's top two hitters gave him a lead Tuesday, and Nipomo right-hander Anthony Campos did the rest. Ricky Iniguez (.485 average going into the game) snapped a 1-all tie with a go-ahead single in the bottom of the fifth, Carmelo Hernandez (.510 average going in) followed with another RBI single and Nipomo stayed on top of the Ocean League standings with a 4-1 win over visiting Santa Maria. Abundant sunshine. High 76F. Winds NW at 10 to 20 mph. A few passing clouds. Low 49F. Winds SW at 5 to 10 mph. Partly cloudy skies in the morning will give way to cloudy skies during the afternoon. High 79F. S winds shifting to WNW at 10 to 15 mph.